Yesterday was one of those scrumptious fall days: brisk temperatures and clear sunny skies. I got to spend the afternoon with two of my favourite people on Ruth’s farm. I’ve posted a series of shots from this mini-photo safari on my photoblog. Love the effect of the well lighted blue skied exterior part of the window with part of the branches showing in contrast to the dark, shaded interiors. The light effects created a rich texture that sums up into one beautiful photo. Thanks for sharing a glimpse of your wonderful trip. A one perfect Autumn day! Best wishes to you and your family…. Thank you, Mr. B. I’m looking forward to another hike of my friend’s farm … as soon as the snow falls. From the shadows and sunlight it could be outside looking in, but there are trees outside the window. Inside or outside, nice photo! And thanks for mentioning my blog! Thanks for stopping by … and for the feedback. It was taken outside looking in and through the barn. I was with a pal who was busy managing her new puppy … she saw the shot and I was the lucky one to capture it. I really like the interplay of light and shadow. thank you for the feedback. Nature had more to do with the interplay than anything I did. We were out around 3:00 pm, and it was a rare Fall day because the sun was brilliant … not the dull days from the past couple of weeks. Thank you for stopping by as well as the feedback. 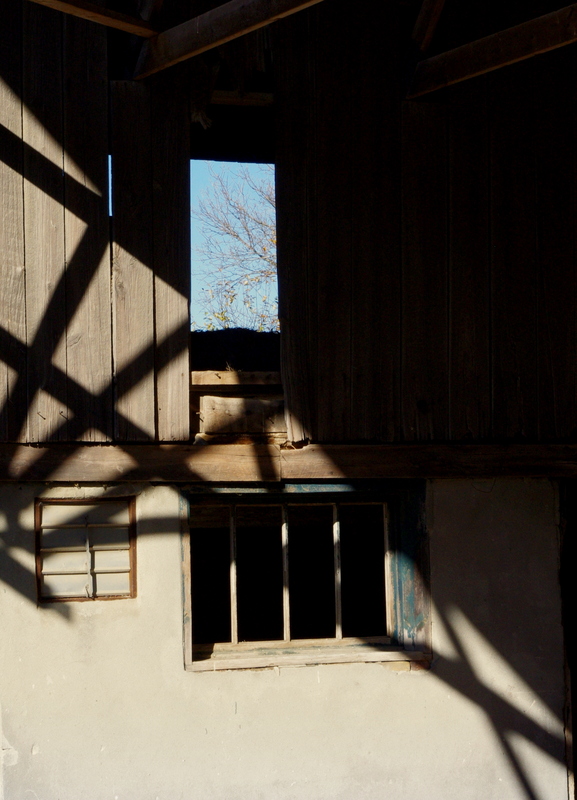 Love the rural rustic look of the barn windows. I’m going to eat my breakfast and come back and check out your photoblog! Thank you for the feedback. The Farm Series from yesterday’s visit to Ruth’s Farm … 9 images plus this one. I’d love to hear what you think. It’s starting to get too cold to do picture taking outside here in MissouREE!